Recent radio broadcasts of "Jupiter Duo" include: ONLY STRINGS Radio on December 13, 2017 (Book of Prayers, vol. 1 series II: movement III. ); December 20, 2017 ( Book of Prayers, vol. 2 series IV: movement III); Jan 31, 2018 (Querying the Silence I, II); as well as on WRUV and KNTU with Host Lloyd Sitkoff - on 01-09-2018 featuring Querying the Silence: vol. 1 series 2: mvt. II. 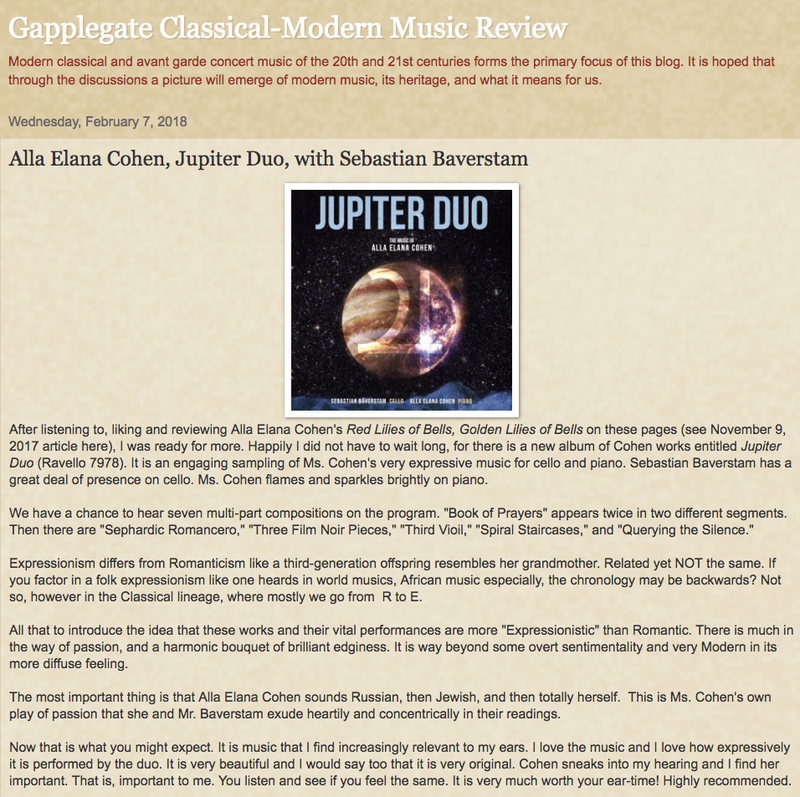 WRUV Radio and KALX Radio have also broadcast the "Jupiter Duo" CD. 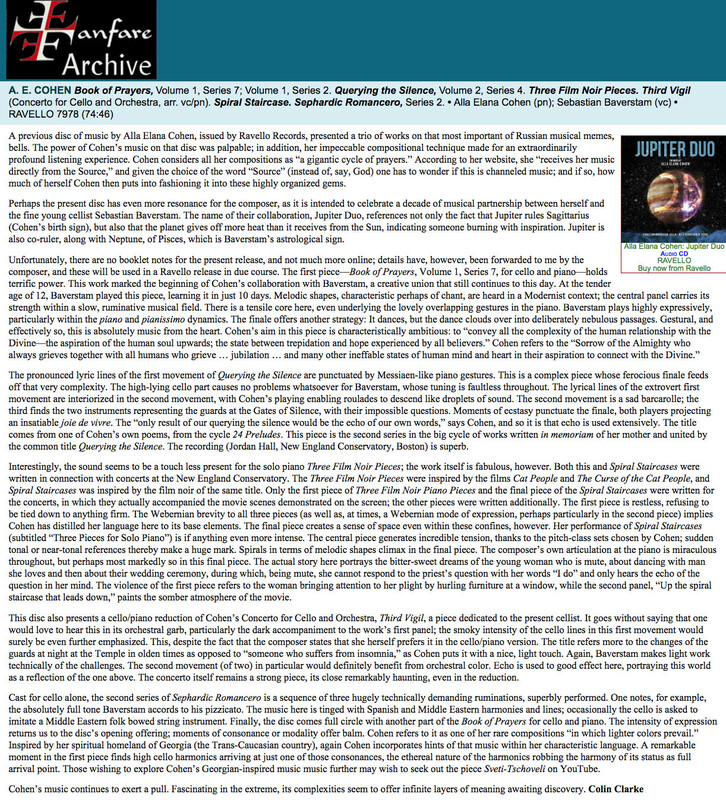 "Kathodik" recently reviewed Alla Elana Cohen's new CD "Red Lilies of Bells, Golden Lilies of Bells, White Lilies of Bells”. The review in Italian and English is now available. Radio Indonesia has broadcast Cohen's "Querying the Silence" for cello and piano recently. "Fanfare" recently published an interview and reviews of Alla Elana Cohen's new CD "Red Lilies of Bells, Golden Lilies of Bells, White Lilies of Bells”. 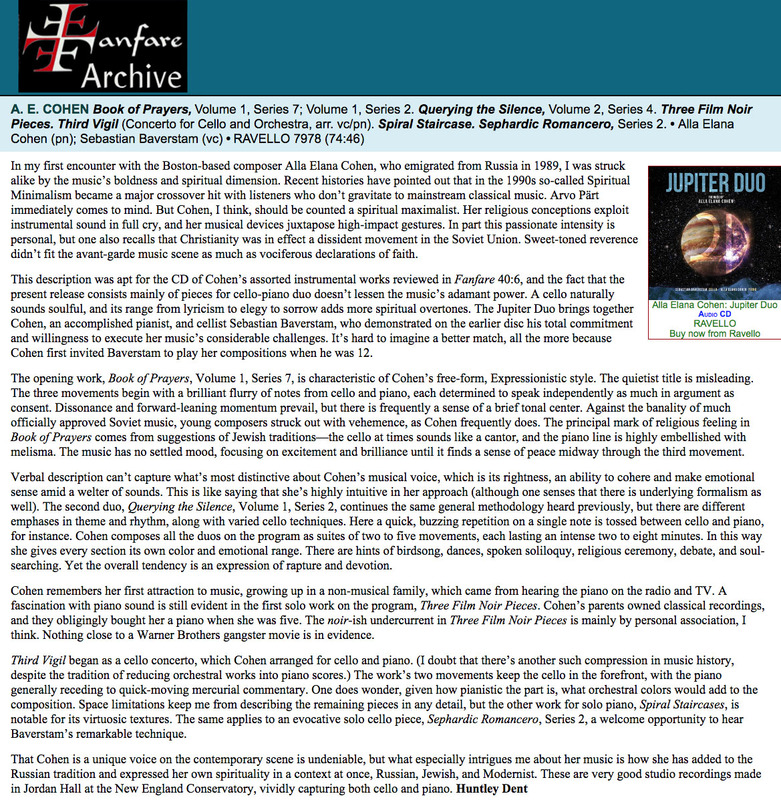 The interview and review by David Deboor Canfield are available; the review by Colin Clarke is available; and the review by Huntley Dent is available. Classical Music Discoveries recently featured RED LILIES OF BELLS, GOLDEN LILIES OF BELLS, WHITE LILIES OF BELLS. Read the article. Learn more about RED LILIES OF BELLS, GOLDEN LILIES OF BELLS, WHITE LILIES OF BELLS on Ravello Records with information about the album and other Ravello April releases; an “Inside Story” interview with Alla ElanaCohen; or visit reseller pages at: Amazon; iTunes or Spotify.
" If you speak about new music, what do you mean by new music? If you mean the music of the great American composer Alla Cohen, humankind has to grow to reach it, humankind prepares itself to it, as Alla Cohen explores the new direction in classical music, in which 'pra-matter' unites in cosmic order. I have made a program in Russia on radio-station Orpheus about her famous "Cat Murr" Quintet, and multitudes of people wrote to me: "We were convinced, we understood! What a miracle, what a discovery!" I am sure, that in 50, or 35, or 40 years, all those who love Mozart and Beethoven will add to these names the name of Alla Cohen." Mikhail Kazinik speaks on Alla Cohen during his interview with Latvian T.V. program, May 21, 2013. T.V. interviewer: Are there geniuses now? Are they being born anywhere? Mikhail Kazinik: Geniuses all the time are being born. They do exist now. Mikhail Kazinik: There is absolutely no doubt that they do exist, and even I during my travels to different countries, meet genius people. Just now, I have met in America in Boston at New England Conservatory and Berklee College, a composer, Alla Elana Cohen. I listened to her music, I spoke with her, and I understood that before me is a regular genius. Here is the link to the radio program on Alla Elana Cohen's music, broadcast on the 17th and 20th of July, 2013, in Moscow, in Russia State Radio and TV Center of Musical Programs, on radio station Orpheus, author of the program - Mikhail Kazinik. "You ask me, if there is now classical mentality in music, and composers, who would talk to us in eternal language. I will tell you, that I would not find a better composer than Alla Elana Cohen. This is a completely unique voice in music - this is unbelievably deep." On the 17th and 20th of July, 2013 the radio station Orpheus in Moscow, Russia, broadcast a cycle of programs on Alla Cohen's music. The author of programs is Mikhail Kazinik. Mikhail Kazinik's programs have the highest ratings among all the programs of Orpheus, and Orpheus has the highest rating among the radio stations, that broadcast classical music in Russia. Mikhail Kazinik, world-renowned musician - violinist, musicologist, teacher, writer, philosopher, author of numerous musical radio and TV programs in Russia, Australia and Sweden (radio stations Orpheus, Rain and Silver Rain, SBS, AXESS TV etc. ), Leading Expert and Curator of Nobel Prize Concerts (Sweden), author of books "Mysteries of Genius" I and "Mysteries of Genius" II, author (together with I. Shadhan) of 64 films "In the Free Flight or Ad Libitum", dedicated to the great composers and interesting phenomena of culture, author of numerous books and articles, dedicated to the perception of music. "The music of American composer Alla Cohen struck me, awakening in me a long-forgotten sense of connection with Eternity. First and foremost, Alla's perception and treatment of musical tones and their combinations is as ancient magic. Her idiom is rooted in 'pra-music'-in those bygone times when music wasn't a commodity, but existed as magic-as mysterious, esoteric knowledge. And we are not only talking here about the flavor of Judaism and ancient roots of Alla's music. Immediately, associations appear in my mind with the original meaning of the word 'composer' -someone who puts together, who compiles. One starts to ponder over the 'pra-matter,' over the mysterious cubes out of which the Universe and Civilizations were created. Secondly, together with all of its magic deeply rooted in ancient times, Alla's music carries genuine intellectual knowledge. In the memory springs up Kandinsky-the Consecrated One- with his book On the Spiritual in Art, and parallel with it Marc Chagall, with his childlike, generously Mozartian naivete that is welded together with the highest wisdom of millennia. Thirdly, Alla Cohen's music turned my thoughts towards the greatest cult book of the 20th century, The Glass Bead Game by Hermann Hesse, because as composer, Alla strings together musical tones as the 'glass beads' in that game. Alla's tones interact with and penetrate each other like the thoughts of the players of that 'game of beads,' begetting a new quality, a new thought. Fourthly, the idiom of Alla's music awakens in me associations with 'pra-matter' and 'pra-substance,' with monads, apeiron and atoms, with the idea of ancient lore and ancient roots. At the same time, miraculously, there is in it the presence of multiple aspects of musical cultures from bygone times and far away places, and not only of musical cultures (one thinks of Minoan culture with the Labyrinth of the Minotaur, and Ariadna's Thread), but we can trace it even further, towards the fundamental principles and the very essence of ancient religions. The music of Alla Cohen draws me in. It revives in me the feeling of recollection of all that has been forgotten, muffled and drowned by the Great Musical Market. Thoughts come to my mind of a solitary soul in Boston-of a mysterious, monastic cell where there are no newspapers or TV programs, where she leads her unhurried conversation with Eternity. This is genuine Boris Pasternak: "Tell me, my dears, what millennium is out there in the street?" Музыка американского композитора Аллы Коэн меня поразила, вызвала давно забытое ощущение связи с Вечностью. Во-первых, отношение к музыкальному звуку, их сочетаниям, как к древней магии. Корни её интонаций лежат в прамузыке, то есть, в тех временах, когда музыка не была товаром, а существовала, как магия, как тайное знание. И здесь речь идёт не только о «мускусе иудейства» и древнейших корнях. Мгновенно возникают ассоциации с первоначальным понятием композитор, как «составитель». Сразу задумываешься о первовеществе, о таинственных кубиках, из которых создаются вселенные и Цивилизации. Во-вторых, при всей корневой магии, её музыка несёт в себе подлинное интеллектуальное знание. В памяти всплывает Кандинский, с его книгой Посвящённого «О духовном в искусстве». И параллельно - Марк Шагал, где детское, щедро моцартовское, как бы наивное, обладает высшим знанием мудрости тысячелетий. В третьих, Алла Коэн своей музыкой обращает меня к величайшей культовой книге 20 века «Игра в бисер» Германа Гессе. Ибо композитор нанизывает звуки, как «стеклянные бусы», звуки проникают друг в друга, как мысль игроков, рождая новое качество, новую мысль. В четвёртых, интонации её музыки вызывают у меня ассоциации с первовеществом, с монадами, с апейроном, с атомом, с идей древних знаний и древнего начала. Но самым чудесным образом в них существует масса аспектов пройденных музыкальных структур. И не только музыкальных. Минойская культура с лабиринтом Минотавра и нитью Ари-адны, и ещё дальше - к первооснове древних религий. Музыка Аллы Коэн притягивает меня тем, что даёт ощущение припоминания того, что забыто и заглушено Великим музыкальным рынком. В голову приходят мысли об отшельнице из Бостона, о таинственной келье, куда не приходят газеты и ТВ программы, где идёт неспешный разговор с Вечностью. Ms. Cohen was also featured by WGHB. "The TV host, Jared Bowen, remarked that WGBH received many highly positive responses to his segment on Alla Cohen--a lot of good feedback, in which people praised both the music and Alla's sincerity and told the station how touched they were with it." "Evidence abounded — as if the enthusiastic audience needed proof — at Boston’s Old South Church on June 7 that Alla Elana Cohen is a musical force to be reckoned with...I am in awe. The audience gave her a standing ovation. She earned every note of it." " Composer Alla Cohen is a pianist and music teacher whose deeply spiritual works are reaching a broader audience..."
"...sophisticated harmonies and rhythms... blazed forth with utter clarity...'The Music of Alla Cohen' brings this intriguing and worthwhile composer before the public eye in a way that hopefully will lead to more concerts outside academia." "On the new CD, Cohen’s music is by turns austere and lush, reverent and brash, warm and cool. The harmonic language is uncompromisingly modern—you will listen in vain for conventional resolutions or minimalist consonance. Her work here has more in common with that of Soviet-era Russian composers—Shostakovich, Shchedrin, Gubaidulina—than it does with the music of Old Russia...It is music that constantly compared the aspirations of the human spirit and the disappointments that come from its oppression. Cohen is both part of this milieu and an escapee from it." Read full article. -- The Boston Musical Intelligencer March 1, 2010. Read the full review here. "Rhythm Divine", a feature in Bay Windows is currently available and chronicles the life and work of Alla. 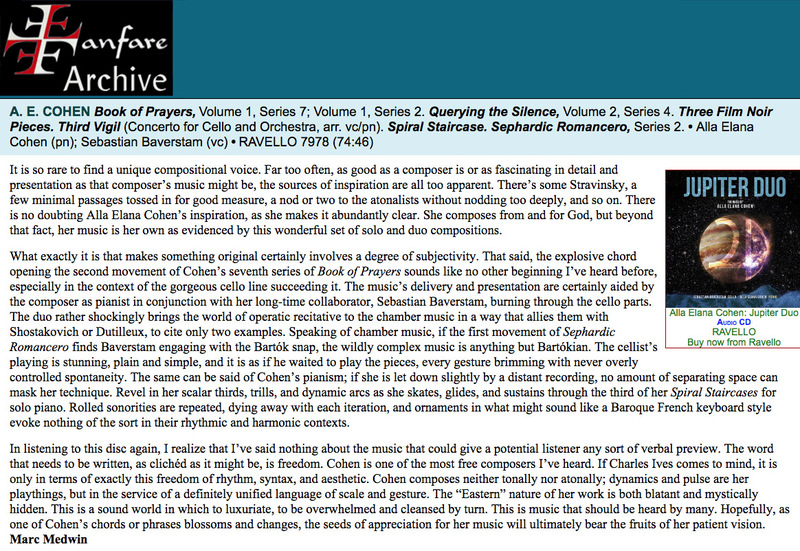 "Pianist/composer Alla Cohen Scales New Heights" published in the Boston Herald is available here. New England Conservatory feature article is also available here. "The relentless intensity of Alla Cohen's music, its characteristic texture and powerful urgency, reveal a composer whose music emerges from the deepest sourses of passion and engagement. Her expressive dynamic is matched by her technical mastery and by her high-minded aesthetic. There is no compromise here. This is music, that simply must be." -- Yehudi Wyner, internationally acclaimed composer and pianist, Pulitzer Prize in Music winner (2006), for 14 years professor and head of Composition Department at Yale University,professor of Cornell, Harvard and Brandeis Universities. "It was a superb concert. Alla, you speak for all humanity! I remember the wonderful high treble register of the cello and piano duet with Sebastian Baverstam, then, the marimba and vibraphone duet, the brevity and the spice of the harmony; and then a wonderful string quartet about which I am still thinking; and I loved the piano solos and the conclusion of the concert: The Inner Temple, Sveti-tshoveli. My ears are still feasting on the concerts that you and Gunther Schuller did this week." "It was so wonderful being in the Keller Room (NEC) last night for Alla Cohen's concert. Her music was glorious, cinematic, her spices, her rhythm, her harmonies, her ensemble - what a pleasure for the listener!" "I think Alla Cohen's music is very exciting, energetic, beautiful, sparkling, very classical, yet very contemporary." -- Yuko Yoshikawa, internationally acclaimed marimba artist, prize-winner and finalist of a number of international and national competitions. "Andrew Fenlon ...share(ed) his thoughts about film noir and the Incomparable Alla Cohen. We soon then (found) ourselves entering the dream world of Dorothy MCGuire. As you hear Alla Cohen's dissonant, spiky piano tones, you will see Helen's face transform from that of a happy bride to that of anguish..."
--Gabriel Chodos, internationally acclaimed pianist, who has performed throughout the US, Europe, Israel, and Japan; for many years was the chairman of Piano Department of New England Conservatory; Professor at New England Conservatory; prize-winner of the Concert Artist Guild Auditions and the Michaels Competition. --Brian Buch, a composer and pianist-performer, prize-winner and finalist at numerous International and National Composers' Competitions, such as Queen Elisabeth Composers' Competition in Brussels,Belgium; International Composers' Competition in Haifa, Israel; Lepo Sumera Competition in Tallin, Estonia; International Robert Helps Prize (US); 1sr Prize winner at National MTNA Composers' Competition (US). 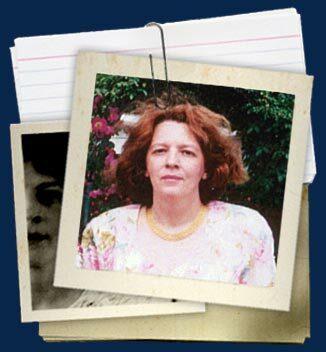 “I was so very fortunate to be able to attend a concert of the works of Alla Elana Cohen during June 2007 in Boston, MA. It was a remarkably varied program, extremely well prepared and well performed by the many soloists, with Alla at the piano. My immediate thoughts were to the incredible contrasts in her compositions, yet an unfailing awareness to detail, structure, texture and orchestration. Her program was very well received by the large audience present. It was a very exciting evening of new music by an excellent composer, pianist and dedicated artist. I am proud to be the publisher of "Perfect pitch for You" - Alla's brilliant pedegogical study on the subject. I certainly look forward to publishing more of her work." --Leonard Rhodes, distinguished pianist, organist, composer., Licentiate,Royal Academy of Music, London (UK), Founder and Executive Director of Pikes Peak Young Composers INC, Owner:Len Rhodes Music Publishing (ASCAP). "A composer on the level of Mozart or Beethoven. A master teacher that gives birth to a new school of great composers. These two are one, and they both reside in Boston. After hearing rehearsals for Alla Cohen’s upcoming concert at the Wimberly Theater at the BCA in the South End on February 12, I see that Boston has a great composer in its midst who has the potential to change the future of music. After studying composition with Alla Cohen, and watching her other composition students, I know that a new, great school of music is forming out of Boston, and it too will change the future of music. “There is no compromise here. This is music that simply must be,” says Yehudi Wyner, another great Boston composer, about Alla Cohen’s music on her event poster, and he is right. This is music that comes from a complete musical master, and is itself complete. The power of Cohen’s music is at one and the same time intense and sublime. It is immensely engaging, very energetic and generously shares its deeply connected passion with the listener. It has qualities not recently seen in classical music. It is unique. This is music that moves us again, and this is where music is today. In the great arch of classical music that stretches from the middle ages, this is the next segment. We see now, though, that the great arch is more like a sine curve, because it goes up again with Alla Cohen. As things dipped in the last century, Shostakovich died, experiments were tried, and searchings and systems plied a way toward obscurity. With Cohen, we see that we have passed the trough. The wave begins to gain again. Coming from the Moscow Conservatory at a time when it was at its peak, Alla Cohen began to teach in Boston. The Moscow Conservatory was at that time the acropolis of music, and produced some of the greatest musical talents in history. Alla Cohen is one of those. She is a remarkable artist, musician and performer. One must really know and work with Alla, to realize that the level of her musical abilities is such that America has not often known. What is also remarkable is her ability to impart that talent to her composition students. The achievements of her composition students, young and old, are great enough to be considered a successful musical career. There is being created a great new school of composition from her studio here in Boston. How sorry those people seem who squabbled over Beethoven’s affairs before and after his death. How strange that Mozart’s body was laid in a pauper’s grave. It seemed that great music was a natural part of the world, and that great composers and teachers would keep coming and giving. Would that the world treated its great musicians as the treasure they are. Grateful are we that they did keep coming, if even intermittently, and lucky are we to have a very talented and giving one right here in Boston."